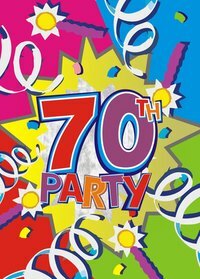 The 70th birthday is truly a milestone year, and there are a number of funny gift ideas that can brighten the day of the septuagenarian in your life--whether it's your parent, grandparent, uncle, aunt or friend. Help make him feel forever young through the joy of laughter. If the recipient has a morbid streak, a hat featuring a cartoon dog playing dead and the slogan "In dog years, I'm dead" is sure to crack a smile. Gifts.com says, "Forget the slogan, 'Over the Hill.' 'In Dog Years I'm Dead' really hammers home the idea that you ain't gettin' any younger." A T-shirt that states what may be obvious to the birthday girl: "It took 70 years to look this good" is a can't-miss on the big 7-0. The design comes in multiple colors and cuts and typically costs between $20 and $30 at most online retailers. For the senior wine aficionado, a sign that says "Age Improves with Wine" is a perfect gift to hang over a bar area or liquor cabinet. Most people are familiar with the fact that age improves wine, but this sign shows the newly christened 70-year-old that getting older can be easier with a delicious glass of vino.